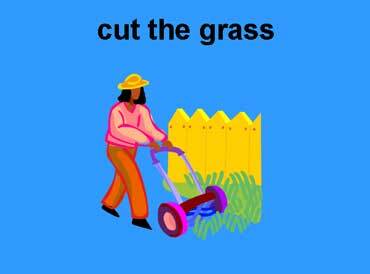 The woman is cutting the grass. She is pushing a lawn mower. 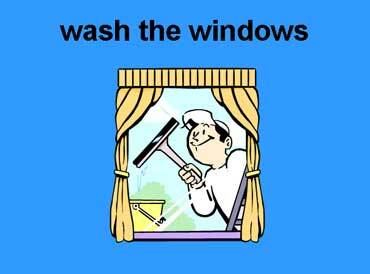 The man is washing the window. He is using a squeege. 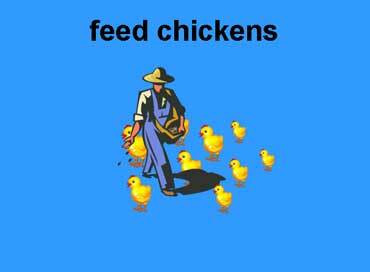 The farmer is feeding the chickens. He is sprinkling the food on the ground. Copyrights to the pictures and photos on this ESL and EL Civics website belong to individual photographers. We have purchased the rights to use them. You may print any of the free worksheets for classroom or home use. Contact Christina Niven at christina@elcivics.com. Please send corrections, comments, and requests for new lessons. Copyright © Christina Niven, 2007.